A twin narrative of travel through the Middle East and North Africa: first through the eyes of 12-year-old American-born Nour, a girl with synesthesia, whose mother brings her and her sisters back home to Syria after the death of her father, and the second through Nour's retelling of her father's favorite story and its heroine, Rawiya. Nour's family isn't home long before the violence in Syria sends them on a quest to find a new home. The refugee story is made magical through Nour's imagination, though the truth of what it means to be without a home - or a country - also comes through. The language is gorgeous, full of color, light, and music. This is a heroine's journey, with resilient women surviving some of the hardest circumstances. It is also, ultimately hopeful. The kind of book you want to read again as soon as you finish it. 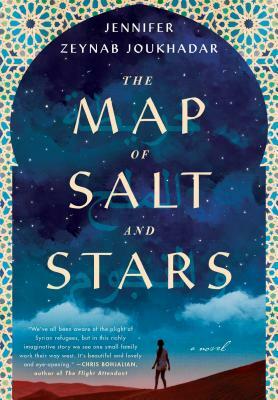 A twin narrative of travel through the Middle East and North Africa: first through the eyes of 12-year-old American-born Nour, a girl with synesthesia, whose mother brings her and her sisters back home to Syria after the death of her father, and the second through Nour's retelling of her father's favorite story and its heroine, Rawiya. Nour's family isn't home long before the violence in Syria sends them on a quest to find a new home. The refugee story is made magical through Nour's imagination, though the truth of what it means to be without a home - or a country - also comes through. The language is gorgeous, full of color, light, and music. This is a heroine's journey, with resilient women surviving some of the hardest circumstances. It is also ultimately hopeful--the kind of book you want to read again as soon as you finish it.